This class will be the next step in mastering the sewing machine! You will be putting all the skills you gained in the entry level classes to the test. During this class you will be creating your very own basic clothing item from beginning to end. This will include: fabric selection, pattern making, assembly to finished product. Read description of MODERATE level skills/CLASS RULES below. Click HERE to sign up/purchase this class! Advanced Level: This class is for experienced sewers. You must have mastered the skills listed in the Moderate course and ready to advance your skills. You will be creating patterns, selecting proper fabrics, making clothing, costumes, accessories, or home decor from start to finish! There will be no refunds issued for no shows. Please make sure you are dedicated to attending classes prior to signing up as no refunds will be issued for any reason. You may show up to class 10 minutes prior to start, to ensure you are not late. Classes will start ON TIME and I will not be able to stop to catch someone up as we only have limited hours to learn as much as possible. I will offer a 15 min question asking session after each class to make sure everyone is on track. Machines and sewing notions (needles/thread) will all be supplied for each class. For final exam projects, you will be responsible for purchasing fabric during a JoAnn Fabrics field trip, so please make sure to bring proper money to purchase the fabric of your choice! (this is not included in course fee) Fabric price points vary so the amount you will be spending on materials will vary but, typically will be within a $10-15 range at best! ***There are tons of coupons on the JoAnn Fabrics website for sometimes 50% off your purchase or more! You can log onto the website joann.com or download the app. During these classes you will be using MY machines to allow for a fast and efficient learning environment. In order to take my courses you must use the machines provided for each class. No substitutions will be allowed and there will not be a discount given for bringing in and using your machines from home. ***I have digital machines that are extremely user friendly and cost approximately $150-$250 at your local Walmart, Amazon, or JoAnn Fabric locations. I suggest if you want to start sewing consistently, to go and purchase one of these machines and practice, practice, practice at home. You do not need to purchase a machine for my courses but again it is highly recommended to have your own machine at home. If you own a different type of sewing machine at home and wish to continue to use it in your free time, I am more than happy to provide you with some additional class time with YOUR machine on an individual basis after you have passed the entry level course. Individual lessons on your personal machine will vary in class date and fees. Please feel free to inquire. Date and Time for classes will vary depending on availability of members signing up. 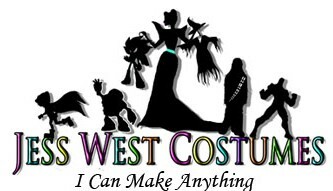 The shop classes will be held at Jess West Costumes Shop located 15 minutes east of downtown Indianapolis right off Interstate 70 East. Address and directions will be provided once you have signed up for classes. If a class is canceled for any reason, the customer will receive a full refund from Jess West Costumes for the class. In order to secure your spot you must make payment for class. Click HERE to purchase a class. Sign up quick to secure your spot! Want to take over my shop with your friends and have a sewing party?! Or would you like to host a sewing party in the comfort of your own home?! Have a sewing party with friends! I will bring the supplies and machines to your home. All you need to do is invite your friends!! Classes or parties at home require a minimum of 3 people with a maximum of 6. Members of the party can opt for an entry, moderate or advanced level class option for the entire class as a whole. Moderate level classes do require passing the entry level course and advanced require passing entry/moderate level classes. Pricing will vary depending on the class level. Additional fees will be added to pricing for traveling costs for at home sewing classes with friends and noted at the time of party booking. To fill out a SEWING PARTY form & book your sewing party click HERE!